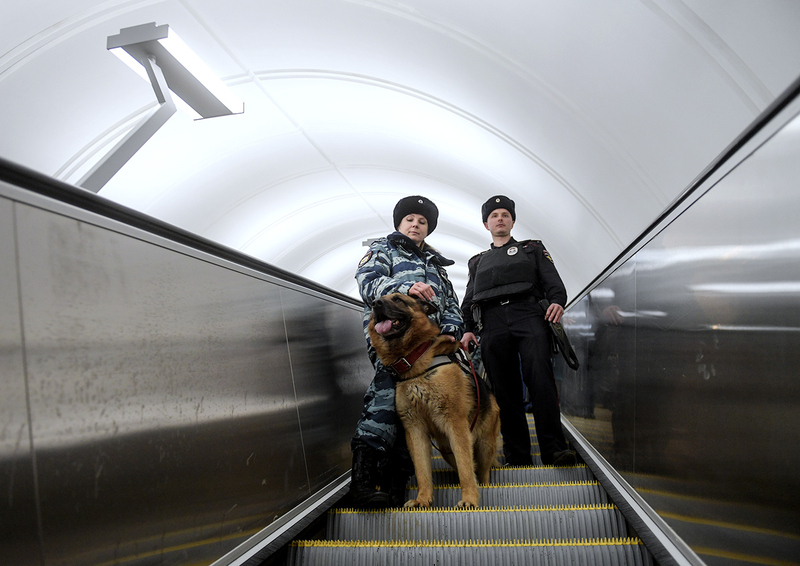 Moscow metro dog service center's employees patrol a Moscow metro station with a dog. It takes a special canine to detect danger and they could save many lives. Following the act of terror in the St. Petersburg metro, the authorities have boosted security, doubled the number of police units, and increased inspections. Most metro platforms are also now patrolled by police dogs. RBTH asked two experts about how these dogs are trained and how effective they are at detecting bombs. The question of what detects an explosive device more effectively was answered a long time ago. The whole world uses a combination of methods: Technology and bio-detectors (according to Russian law a dog has the status of a special resource in the fight against crime and is not considered a police officer unlike in several countries – RBTH). It's important that both are used. Technology is incapable of completely replacing dogs. Firstly, it’s quite difficult to make a portable device that could identify all types of substances and that’s comfortable to wear. Also, a person using the device would have to get very close to suspicious objects, which may not be safe. Secondly, unlike technology, the dog has a strong psychological effect on the terrorist, especially those from Asia – they tend not to really like dogs. And considering the fact that the terrorist is probably already stressed, if he sees a dog, he can either give himself away or change his mind about carrying out the act. Training a dog to detect narcotics and explosives usually take at least 90 days, although this depends on the technique used. In Russia dog trainers mostly work with imitator substances, not with real ones. Many services have difficulty obtaining the real thing. But preparation using only imitators does not give the sufficient reliability since they don’t give off a realistic smell. It’s also difficult to predict how a dog will react when it comes into contact with real drugs or explosives for the first time. So it can take time to fully train a dog before it is reliable. We buy various dogs. It all depends on the service's connections and finances. We'll take a mongrel only if we have to use it in a secretive manner, without attracting attention. In general, only pedigree dogs are used. They are like a special instrument. Finding a good working dog that’s a mongrel is rare, while a pedigree dog – whose parents were search dogs – improves its prospects hugely. The dogs are always tested. There are tests that check the puppy's desire to play and its interest in food, for example. Because if a puppy does not want to play or eat, how can you train it? There are tests that check its communicability, its reaction to high-pitched sounds, and tests that check its hunting instinct. The probability of a dog discovering an explosive device, if it exists, is more than 90 percent. Each dog handler has one dog, which he trained. If during the inspection the dog handler says that there is no explosive when in fact there is one, he will bear responsibility, and sometimes even criminal responsibility. On average a police dog in Russia costs 50,000 to 60,000 rubles ($890 to 1,100), but the prices vary, as in Europe. There prices can reach up to $2,100. We don't take mongrels. German Shepherds, Labradors, Spaniels – these are the main breeds for police dogs. Sometimes insufficient socialization can be improved by taking the dogs around Red Square a couple of times or to the metro. The dog is guided by his inner instinct. This way the dogs won't bark if they find something. They're not allowed to. They are trained to use special signals: A special way of standing, sitting, or pointing. Many observers believe that if in a metro the dog is just sitting or lying, it means it is not working, that it is not effective. But actually this is normal – the dog needs to rest. Its goal is not to spend hours going back and forth along the platform searching for something. Its function is to quickly and adequately examine a strange object if the dog handler notices it.